Preheat oven to 275 degrees F. Line muffin tins with paper liners. Place 1 whole cookie in the bottom of each lined cup. With an electric mixer on medium high speed, beat cream cheese until smooth, scraping down sides of bowl as needed. Gradually add sugar, and beat until combined. Beat in vanilla. Drizzle in eggs, a bit at a time, beating to combine and scraping down the sides of the bowl as needed. Beat in sour cream and salt. Stir in chopped cookies by hand. Divide batter evenly among cookie-lined cups, filling each almost to the top. Bake, rotating pan halfway through, until filling is set, about 22 minutes. Transfer to wire racks to cool completely. Refrigerate at least 4 hours (or up to overnight). Remove from tins just before serving. Thanks so much! They were REALLY easy to make! I see that it says 2 pounds of cream cheese is it 2 pounds or 2 packs ? I just realized that I never got back to you about these. I think your sister had told you that I ended up baking them for double the time and I was confused if I had screwed up something. I ended up baking these during this past weekend and precisely followed your recipe. The 22 minutes do work fine. I knew that cheesecake had a different texture, but even though it may not look done to the eye, it is definitely done. 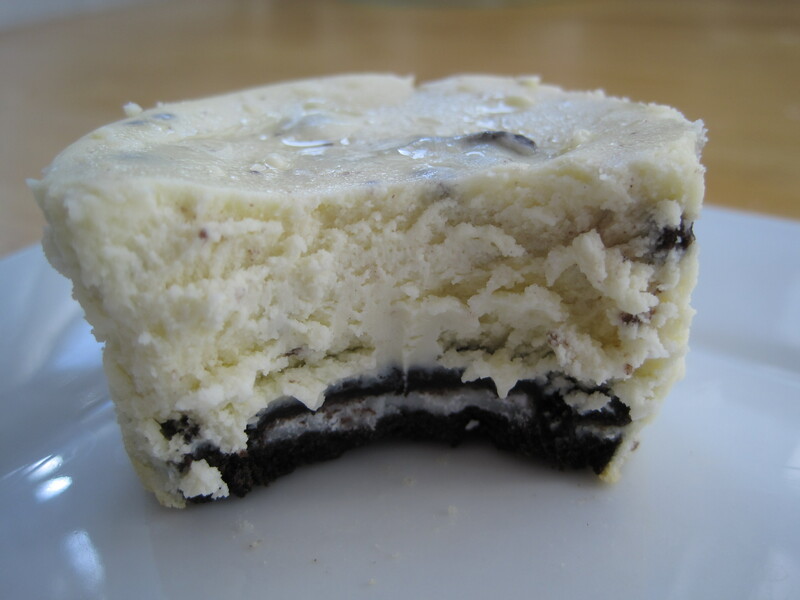 The ones I made last time were overcooked…you couldn’t really tell by looking the cheesecake, but more the cookie at the bottom. Once again, I really appreciate you letting me know how things went! Have a great day! Thanks so much for your comment! I really hope you like it! Personally, I like the taste of the peaches and cream cheesecake cupcakes more. Probably going to try and make these for my boyfriend for Valentines Day! Thanks for sharing this! I’m so glad to hear that! I hope you both like them 🙂 Thanks for your comment! Hi DG, I used 2 pounds of cream cheese, that’s almost 4 x 250 gram packages. 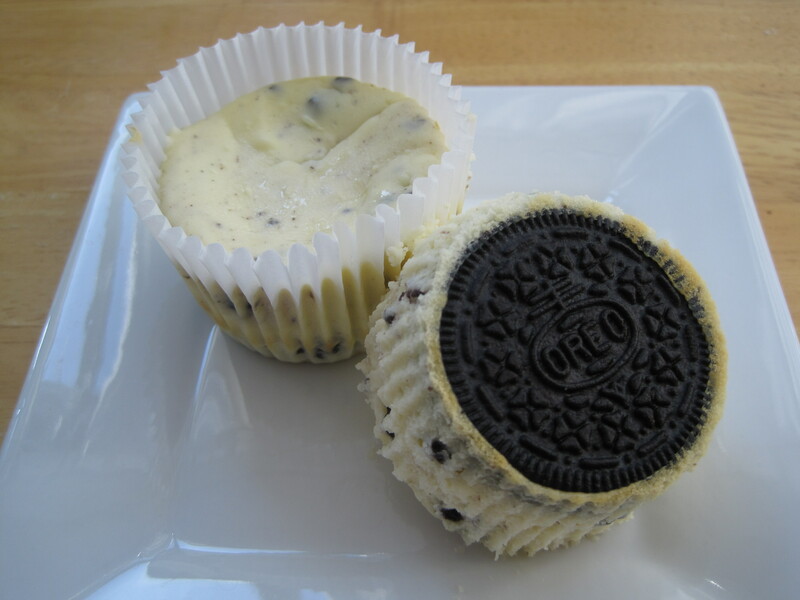 However, you could use 2 x 250 gram packages of cream cheese if you prefer to 1. save money, 2. serve cupcakes with fewer calories, and 3. have a smaller ratio of cream cheese top to oreo cookie. Thanks so much for your question! I’m so glad to hear that! 🙂 Thanks for writing!